The biggest problem with the current sixth-generation Corvette is all the tired stereotypes that come with it - especially those referencing its interior quality and cornering ability (or lack thereof). Putting those aside, what we’ve got here is an undiluted sporting machine designed by car people, for car people, and assembled in its own Kentucky factory with minimal interference from MBA types. It’s inherently awesome. Moreover, our Z06 Centennial Edition test car is arguably the ultimate Corvette, a genuinely terrifying two-seater with a naturally aspirated 505-horsepower V-8, mandatory six-speed manual transmission, GM’s world-renowned magneto-rheological dampers, and insane racing tires scored with a few shallow grooves for the sake of legality. Remarkably, the Z06 remains comfortable and confident on the highway, a true grand-tourer that just happens to be one of the quickest production cars ever around a track. With the exception of those silly tires, more on which below, it’s the best car America makes—and yes, that includes the more expensive, less terrifying ZR-1. The Z06’s exclusive 7.0-liter V-8 just might be the most wonderful thing on the planet, and the driving controls are all spot-on. Cornering limits are incredibly high, with multiple stability-control modes to match different skill levels, yet the highway ride is calm and collected. The optional sport seats are considerably more comfortable and supportive than the standard ‘Vette chairs. The hatchback trunk will swallow two golf bags and your weekly groceries with room to spare. Those crazy tires compromise ride quality on rough pavement, causing some very un-‘Vette-like impact harshness. As ever, the Corvette feels wider and heavier than it is, which saps driver confidence on tight roads. The navigation system and digital displays look exceptionally dated by 2012 standards, though they’re quite functional. The center tunnel gets hot even in normal driving—don’t leave your glasses in there. The flimsy nylon cargo curtain behind the seats is weird. As you ease the Z06’s surprisingly docile six-speed stick into gear for the first time, you’ll probably still be smiling from the ignition experience. The LS7 V-8 doesn’t just start; it roars to life like a bear prematurely roused from hibernation. We’re getting ahead of ourselves—the engine section is up next—but it’s difficult to talk about the Z06 apart from that motor, which, like the track-tuned rubber, amounts to thinly disguised racing equipment. Speaking of which, the tires are Michelin Pilot Sport Cups—285/30/19s in the front, 335/25/20s in the back—and they’re nuts. Road noise is aggressive, compliance over bumps is minimal, and you basically can’t use them in the rain. Sure, their performance on smooth surfaces is phenomenal, but we think they demand too many sacrifices for daily driving. 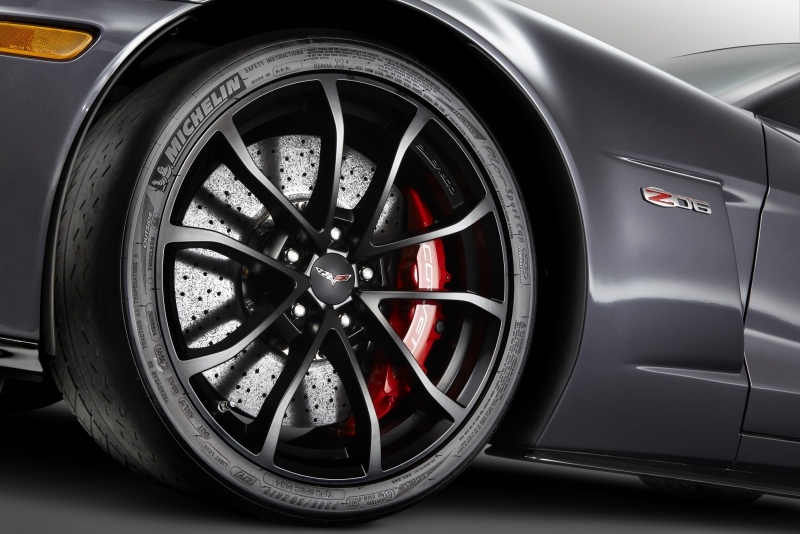 Lesser Z06s ride more comfortably and quietly because they come with higher-profile rubber on smaller (18â€ front, 19â€ rear) rims. As for the rest of the Corvette’s dynamic portfolio, the steering responds immediately but with serious resistance, as if to say, “Are you sure you want to do that?â€ The Performance Traction Management system provides four settings with even heavier steering and progressively less computer oversight, culminating with “Death Wish,â€ or as Chevy calls it, “Off.â€ Cruising back from the track on the freeway, the Z06 loves the fast lane: only high-buck German cars are similarly confident at high speed. However, while the optional magneto-rheological dampers strike an excellent ride/handling balance on their own merits, those nutty tires mostly negate the “rideâ€ half, so again, consider going with the smaller, higher-profile tires when you’re not doing hot laps. The rear-wheel-drive Corvette Z06 Centennial Edition comes with a six-speed manual transmission and a 7.0-liter V-8 that supplies 505 horsepower and 470 pound-feet of torque. Amazingly, the Z06 only weighs about 3,200 pounds, even with that enormous lump in its nose. So this is a monumentally rapid car. Once you crest 3,000 rpm, the exhaust flaps open up, and the Z06 thereafter does a bang-on impression of a stock car storming down the back straight. Moving out to pass at highway speeds is almost like accelerating from a standstill; to wit, the Z06 will do 60 to 120 mph in around eight seconds. Second gear doesn’t relent until you either hit 90 mph or faint and hit a tree. This is one of the few cars in the world whose engines alone are worth the price of admission. The EPA rates the Corvette Z06 at 15 mpg city, 24 mpg highway, and 18 mpg combined, which is downright respectable for a 505-horsepower hypercar. Corvettes were big on technology in the 1980s, boasting innovative features like trip computers and digital head-up displays. Unfortunately, the current Corvette’s cabin technology seems to have been borrowed from one of those ‘80s ‘Vettes. It’s unquestionably this car’s Achilles’ heel: whereas the competition’s got all manner of fancy display screens and contemporary gadgets, the Corvette is still rocking rudimentary digital readouts. But there’s a silver lining here: everything works, from the DVD-based navigation system (which, to be fair, looks more like a late-‘90s product) to the USB interface’s music filing system. The Bose stereo sounds crisp and powerful, too. In other words, the engineers did their jobs. Indeed, more than anything, the primitive graphics symbolize the engineering-driven nature of this car. GM could have dispatched some interior-design gurus to spruce things up, but instead it apparently just let the engineers do their thing. Granted, the Germans are synthesizing engineering and design astonishingly well these days, but if you’re going to have one or the other, well, the Corvette team had its priorities in order. Look around the Corvette’s interior and tell us what the problem is. Please. Because we just don’t get it. Everyone talks about the “soft-touch materialsâ€ in the GT-R and 911, but what’s that stuff covering the Corvette’s dash? Yep, it’s soft. Alright, so maybe the armrests aren’t adequately padded? Hm, nope; plenty of padding. We’ve discussed the cheesy displays, but that’s a technology issue. And we pushed and prodded everything in sight; build quality seemed sound. Other than the bizarre nylon cargo curtain, the inexplicably flimsy seats, and the perpetually toasty center tunnel, it’s a pleasant, intimate environment, with a perfect sports-car driving position to boot. A new Corvette is due for 2014 or thereabouts, but we think the C6 Corvette still looks fresh and daring, though we’ve seen too many mustard-yellow base ‘Vettes with chrome wheels to give the C6 our full aesthetic endorsement. 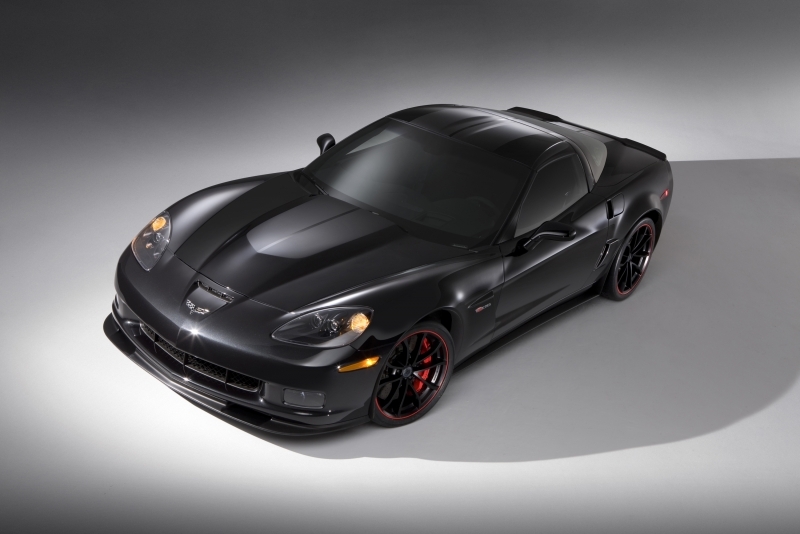 We do, however, wholeheartedly endorse the Z06 Centennial Edition’s sense of style, from the sinister black paint to the saucy red trim on the special black wheels. Also, every Z06 features unique quad tailpipes along with special fender vents and badging. Our test car rang in at a heady $101,760, but that’s with a bunch of options you don’t need. We’d probably spring for the $8,815 3LZ trim level to get the new-and-improved sport seats and a bunch of other desirables (leather-covered dash, Bose, navigation, etc. 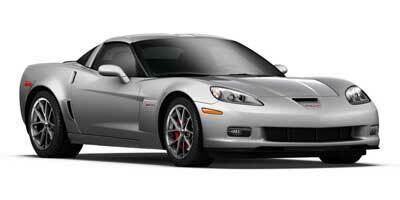 ), but the base Z06 starts at a relatively modest $75,525, so we’d only (only!) be looking at low $80s for our dream Z06. Think you’re getting into a new 911 for that kind of money? Not likely. Nissan GT-R? Nope; it starts at nearly $90,000 for 2012. Audi R8? Low six figures, minimum. 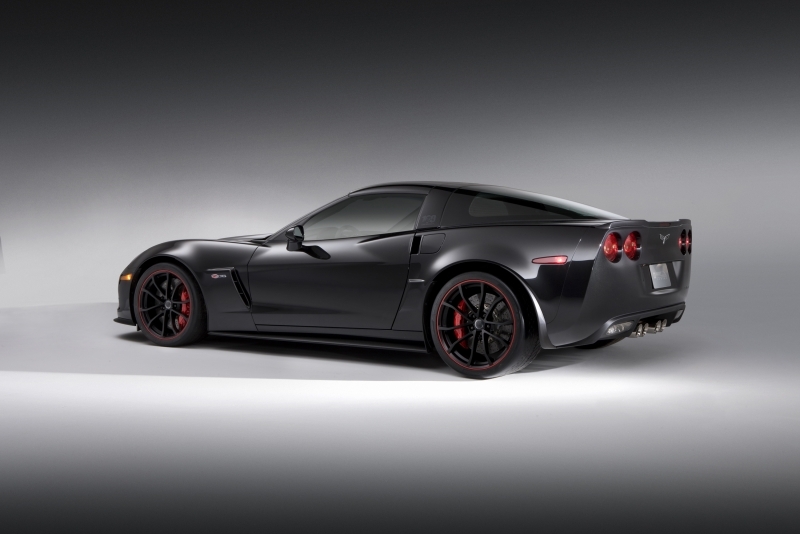 In short, to the extent that an $80,000 sports car can be a bargain, the Z06 is. The Corvette Z06 Centennial Edition with the Pilot Sport Cup tires is a bit over-the-top in both price and temperament, but the regular Z06 is one of the best cars in the world. This is an extraordinary machine. Drive one if you can.